The fad has faded and now you’re swimming in a sea of discarded Silly Bandz that you spent a small fortune on? Stretch your dollar and repurpose them into these fantastic elastic creations. 1. Using a glue gun, secure a colorful selection of Silly Bandz to the inside of your lampshade and let dry. 2. Place lampshade on lamp, turn on light and watch the colorful 3D glow of the Silly Bandz radiate through the shade. 4 4x6 unfinished wood craft frames (glass and back removed). Or recycle ones you already have! 1. Place your frames backside up and glue the ends of each paint stir stick to one end, on the short side, directly in the middle. This will be the body and neck of your guitar. 2. Have kids paint and decorate guitar with glitter glue. 3. Once dry, place 4 Silly Bandz around the picture frame, lengthwise, and let kids strum away. 1. Smooth out any sharp edges at the opening of your can with sand paper. 2. Using a handheld can opener, puncture one or two small drain holes through the bottom. 3. Place a small drop of glue on one side of your can, along the bottom edge; repeat on the other side. 4. Slide a Silly Band over the can, where you’ve just applied the glue. 5. Repeat steps #3 and #4 until the can is completely covered with bands. 6. 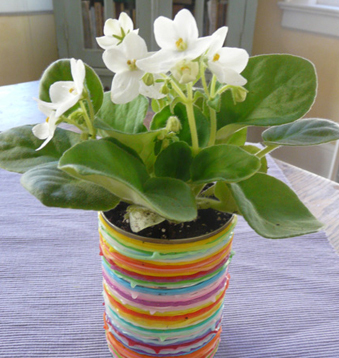 Fill halfway with potting soil, plant with a fresh flower or herb, and place in window. 1. Place sock on hand to establish where the face will be. 2. Remove sock and using a glue gun, attach buttons to form the eyes. 3. Cut each Silly Band; gather and knot at one end. 4. Using scissors cut a tiny hole above the puppet’s eyes, where hair should be. 5. Turn sock inside out and feed the ends of your Silly Bandz through the hole; glue gun the knotted end to secure at the opening. 6. Turn the sock right side out and rock out with your zany-haired sock puppet! 1. Cut 2 Silly Bandz and set aside. 2. Take 4 Silly Bandz and secure together by tying one of the cut bands around them; snip off ends and repeat until you have four bunches of Silly Bandz. 3. Lay out your napkins flat on a table; grab at the center and wrap with your Silly Band napkin rings. 1. Take the short side of your card stock, fold over into a 3-inch flap. 2. Using scissors cut along the folded edge. 3. Cut this in half so that you now have two place cards. 4. Repeat steps #1 through #3 with the second piece of card stock. 5. Glue one Silly Band to each place card and label with guest’s name.